who ruled the Isle of Man and, at least, parts of the Hebrides. He was a younger son of Guðrøðr Óláfsson, King of the Isles, King of Dublin, and his wife Finnguala, a grandaughter of Muirchertach Mac Lochlainn, High King of Ireland, King of Cenél nEógain. According to the saga of the celebrated chief and physician, Hrafn Sveinbiarnson c1166-1213 (as cited in A.W. Moore’s 1900 publication A History of the Isle of Man), Hrafn “and the bishop-elect, Gudmund, sailed from Iceland towards Norway in the year 1202, but were driven by storms to Sandey, one of the Sudreys, where they happened to find Olaf and the bishop, and were compelled by the former to pay a tax, that Reginald had assigned the Hebrides to Olaf.” This saga was presumably the source that Captain Thomas and Professor Munch had used in their earlier respective researches into the matter and it was the Captain’s interpretation regarding the location of Sandey that Beveridge referred to in his book. Thus, thanks to the scholarship of Captain FWL Thomas, we have evidence suggesting that Olaf the Black lived in North Uist in the area of Cill Chaluim Cille (Kilcolmkill) in the vicinity of the burial ground at Clachan Sands and near to Tobar Chaluim Cille , the well of St Columba’s Chapel. In the Sleat History or History of the MacDonalds it is recorded that Olaf the Red, Olaf the Black’s grandfather, killed a MacNicoll in North Uist, although it has also been suggested that it may have been the grandson Olaf the Black who was responsible. Either way, we have two clues pointing to the presence of one or both of the Olaf’s in the island during the 12th and 13th centuries. It would therefore appear possible, perhaps even likely, that it was Olaf the Black who had his summer residence somewhere on the shore of this tidal lagoon which is located within the old farm of Newton and Cheesebay, now known as the Newton Estate, and who gave his name to the loch. Is this, perhaps, a further link to Olaf and the bishop (possibly Michael) cited in the saga? We shall never know for sure but it is tantalising to think that more than 800 years ago this ‘remote’ corner of Uist was in fact sufficiently well-connected to attract a Norse ruler and his ecclesiastical ally to make their respective marks by leaving clues within the naming of the landscape. What began with the discovery of two seafaring brothers who died on consecutive days in September 1872 has developed into the story of the vessel that they were serving on at the time of their deaths. The Eureka arrived at King William’s Dock, Dundee from St Petersburgh on 27 August 1872 with 494 bales and 1431 bobbins of flax weighing more than 170 tons. * She was owned and sailed ‘In the General Coasting Trade’ by Ewen Campbell of Scadabay, Harris but all 240 tons of this brigantine had been built in 1870 across the Atlantic in Prince Edward Island for John F Robertson. Malcolm and Ewen Campbell appear to have been joint owners of the Eureka from the outset, Lloyd’s Register 1871 showing the owners as M & E Campbell. There were many fine sailing ships built at that time in Prince Edward Island for Scottish shipowners. 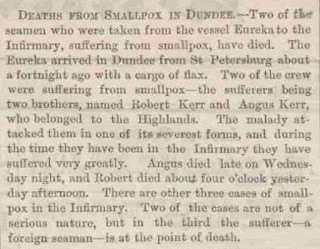 Sandwiched in between these unfortunate accidents were the tragic deaths from smallpox of the brothers Angus and Neil Kerr on the 11th and 12th of September. Malcolm Campbell also died a few months later on 26th December 1872 at Scadabay and at some point Ewen sold the ship and she was eventually lost in Archangel when she grounded during a heavy snow storm. It would be a quarter of a century before another link was forged between the Campbell’s of Scadabay and the Kerr’s of South Harris, this time in the form of the marriage in 1896 of my cousin Marion Kerr from Rodel to Ewen and Malcolm’s nephew, John Campbell, eldest son of Roderick Campbell of Rodel who also held the tack of Borve, Berneray before it was rightly recrofted in 190. Note: I would like to thank Seumas MacKinnon of Scadabay for alerting me to the fact that the vessel my relatives were sailing in was not the one owned by James Deas of St Andrew’s, and for supplying information used in compiling this entry. On the shore of Ob Liceasto in East Loch Tarbert stand the tobhta, or ruined walls, of a house that was built two hundred tears ago. It was home to a tailor John Kerr from Strond and his wife Margaret Martin. They had five sons and five daughters and at least three of the brothers became sailors in the Merchant Service. The first-born, Malcolm, was born around 1822, the sixth child, Angus, around 1838 and the youngest, Neil, in 1848. Their birth years vary in the few written records that remain (primarily censuses as Statutory Registration in Scotland did not start until 1855) so I have used the ages from their death certificates. Malcolm, my great, great grandfather, moved to Stornoway following the death of his first wife (who had given him a son) and he married again in 1848. His second wife, Mary MacDonald, was one of the 143 people cleared from Orinsay, Pairc in 1843 and they had three daughters and two sons, the oldest of whom, Alexander John Kerr , followed his father’s calling to the sea. Malcolm worked in the coastal trade, sailing small vessels of 30 to 60 tons throughout the waters off the West Coast of Scotland including frequent voyages to Belfast and Larne. He was active in this trade for fifty years and died of a heart attack on board Alexander John’s ship the Crest in the Horseshoe Sound, Kerrera on the 15th of December 1898 at the age of 76. His Nationality was recorded as ‘Harris’! Angus Kerr spent several years as a fisherman according to te censuses but on the 11th of September 1872 the 34 year-old father of five died in the Royal Infirmary, Dundee. His occupation was shown as Seaman M.S. and the cause of death was Variola, or smallpox. 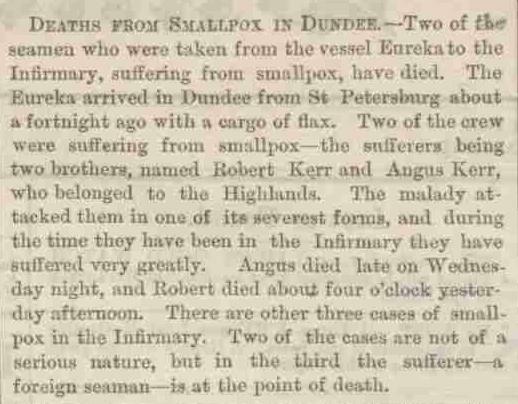 Neil Kerr is recorded in the 1871 census as an Able Seaman aboard the Euphemia Campbell in Moray but just seventeen months later, on the 12th of September 1872, he too died from smallpox in the Royal Infirmary Dundee. He was 24 and single. Their widowed mother, who was in her late-sixties or early seventies, had lost two sons in two days due to this terrible pandemic that reached its peak of 71 deaths per 100,000 people in Scotland in the year that Angus and Neil died. Her husband John had died only five years earlier and together they had borne the pain of the loss of their 18 year-old daughter Catherine a dozen years before that. The entry before Neil’s in the register is that of 22 year-old Duncan MacLeod whose address, like Neil’s, was recorded as West Tarbert, Harris. At least three men from one small part of Harris were lost that week. The population of Harris in 1871 was 4,411. Source: the Dundee Courier & Argus, Friday 13th September 1872. Newspaper Image © The British Library Board. All rights reserved. With thanks to The British Newspaper Archive (www.BritishNewspaperArchive.co.uk). I have only just discovered Neil’s death, and only recently learned about Angus’s thanks to the wife of a cousin, so I have not had time to reflect upon the effect that this twin tragedy may have had on the family. I wonder how many people Harris lost to smallpox at this terrible time? I am proud of my maritime ancestry in Harris, which has tripled in just a few weeks, and I wonder how different things might have been had all three brothers been spared, as Malcolm was, to spend half-a-century sailing these waters through middle and into old-age, encouraging the next generation to take to the sea. Update: The vessel Eureka was in fact not the 69 ton ship of that name owned by James Deas - more details will follow in the next entry! There is a recording on Tobar an Dualchais of the song Eilean Beag Donn A' Chuain (Little Brown Island in the Ocean) by Donald Macdonald Morrison (1859-1951) who emigrated to Duluth, Minnesota. His brother Murdo Morrison left with him but returned to Lewis where he became the postmaster at Bragar, married my cousin Mary Annabella Montgomery, and erected the Whalebone Arch at Lakefield. ‘S a h-eallach cho cruaidh is trom. Gun duine nì suas a call. An Eilean an Fhraoich ud thall. Joanna McCaig (MS McLeod) died in Edinburgh on 2 December 1959 of Cardiovascular degeneration. Her son, Norman, registered the death.. His widowed mother would have been 82 just a few weeks later. This is the only reference we have to William being from Pabbay but the 1841 Census, the last before that island was Cleared to replace people with profit, shows the 8 year-old William together with his siblings Flora (6) and Donald (2) . Their father was an agricultural labourer, John MacLeod (50) and his mother Catherine MacLeod (30). However, there was also a woman in the household called Julia MacLeod (40) and it is interesting to see her name given to William and Effie's firstborn. William and Effie's neighbours in 1871 were Donald MacLeod and family, including Donald's mother, Chirsty. Both Chirsty and Donald were born in Pabbay and I think therefore were William's brother and mother, the whole family having been driven from their home in Pabbay during the 1840s. I am slightly confused by the reference to Effie (Euphemia MacLeod) having been born in Lochs, but it may well be that her mother, Flora Martin (MS MacLeod), was a Lochie for there are many connections between Harris families and those in Lochs, Lewis. Julia MacLeod, 17, was visiting another family in Scalpay at the time of the census, and Chirsty MacLeod appears as Christina MacLeod who, at the tender age of 10, was already working as a 'General Servant' for a family of MacSwains in the island. At 8 o'clock on the morning of Saturday 28 January 1882 Effy MacLeod died of influenza, having been ill for some eight days. Her son, John, registered her death giving her age as 39. At 9 o'clock on the morning of Sunday 12 February 1882 William MacLeod died of severe cold, having been ill for some fourteen days. His son, John, registered his death giving his age as 48. William had survived his wife by just fifteen days and their eight children aged from 2 to 15 had been orphaned in just a couple of weeks. It is almost impossible to comprehend their situation. Nine years later the 1891 Census finds John MacLeod, a 25 year-old fisherman, heading the household that contains his two wool-spinning sisters, Julia (26) and Christina (16), and their brother James (12) who is still at school. Half of the family have stayed together under one roof in Scalpay. Flora (21), Norman (18) and Roderick (16) appear to be absent from Scalpay but may have been elsewhere in Harris. I cannot locate Johanna MacLeod (13) in the 1891 Census, but she is definitely not in Scalpay nor in Harris, however by 1901 Joan MacLeod is working in Leith as a Laundry Maid, the only person with Gaelic in the family she serves. There is also a visitor called William A Peterkin whose occupation is given as 'Artist (Vocalist)' which is somewhat unusual. as a bird its nest. It was being administered by the Factor John Robertson MacDonald on behalf of the Tutors of the 14 year-old 7th Earl of Dunmore and a cursory glance at the Harris Timeline may help provide the context within which this particular roll sits. In this account I have used the spellings as they appear on the original document. The islands near North Uist in the Sound of Harris, owned by Harris following a fifty-year long legal wrangle, we being rented for £7 7s by 'K MacDonald', presumably the farmer Kenneth MacDonald who, in 1847, was the Assistant Factor responsible for the debacle of the attempted resettlement of Borve in Harris. He would later appear before the Napier Commission to give his view of how Harris had been faring during his long period of residence. It is, I think, worth noting that four of these men, John Robertson MacDonald ( Factor, born Snizort, Inverness-shire) John MacDonald, Tacksman, born Harris), Alexander McRae (Tacksman born Glenshiel, Ross-shire ) and Robert Clark (Surgeon, from Argyll) were on the dozen-strong Parochial Board of Harris in 1851 . One thing I am currently unclear about is whether Luskintyre was held by Finlay MacRae, the Minister in North Uist who happened to also be the factor John Robertson MacDonald's brother-in- law, so if anyone can assist in clarifying that then I would be most grateful. Incidentally, about a quarter (26 of 103) of the women weaving in 1851 describe themselves to be a 'Hand Loom Weaver' this number falling to 2 in 1871 and rising to only 6 in 1881 before disappearing from the censuses altogether. I discussed the recording of these 'HLW's in this earlier piece. Incidentally, it is also only in the 1891 census that we see the word 'tweed' appended to the weaving role and, indeed, there are only 5 weavers in that year (and only 1 a decade later) who refer to their produce as 'tweed'.I think this further emphasises that the marketing of woollen produce as 'tweed' only starts to occur in the islands as we approach the end of the century.